In its meetings since June 2016, the Ad Hoc Committee on the Appointment of the Public Protector has now selected the final 5 candidates to be considered. The Chairperson attributed the unprecedented number of nominations (73) to the level of public awareness and participation. Of those nominations, 59 candidates accepted the nominations. 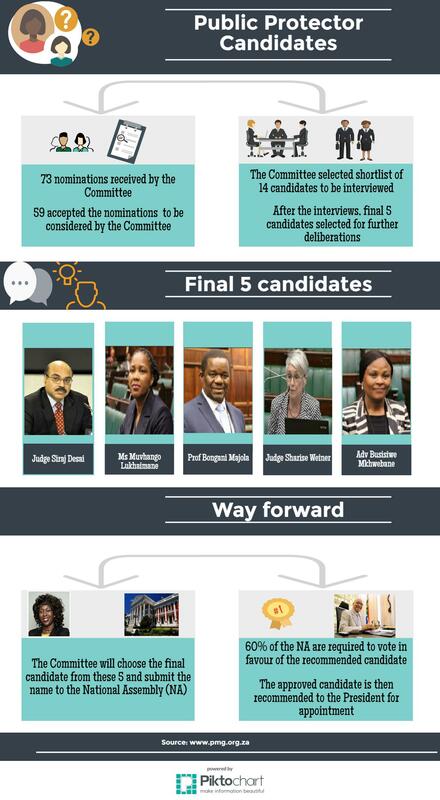 In subsequent committee deliberations, 14 candidates were shortlisted and interviewed. The 20 hour interview session was a grueling process and the final 5 candidates were selected based on their performance and responses to some tough questions by Members. The Committee agreed to meet on Wednesday, 24 August to deliberate on the remaining 5 candidates and select the final candidate for recommendation to the National Assembly before the deadline of 31 August 2016. The name of the final candidate will be submitted to the National Assembly where at least 60% of Members will be required to vote in favour of the recommended candidate. The approved candidate will then be recommended to the President for appointment.